Moringa is popularly known as the ‘drumstick tree’ as its pods resembles drumsticks. It can be found in foothills of the Himalayas in northwestern part of Indias. It has been described as one of the most nutritious crops available. Lemongrass is popular in Asian kitchen. It has subtle citrus flavour commonly used in teas, soups and curries. This herbal combination creates a tea that will soothe your spirit after a long work day. • Good water is an essential part of brewing a great cup of tea. We recommend using spring or filtered water. • Be sure to relax! Some of the most enjoyable aspects of tea are the calmness and ritual that surround it. • This is a delicate herb and is more potent when exposed to high temperatures for ashort period of time. So that your tea has its maximum medicinal properties and flavour,be sure that your water is at a rolling boilwhen you pour it over your teabags. 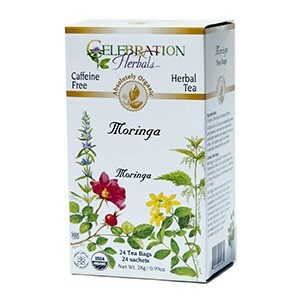 • If you desire a medicinal tea, be sureto use one tea bag per cup of boiling water,cover and steep for 7-12 minutes. Thisis known as the infusion method. • If you desire a pleasure tea or quick brew, use one teabag per cup of hot water. Pour water over teabags, cover, and let steep 3 to 5 minutes to taste. Enjoy!